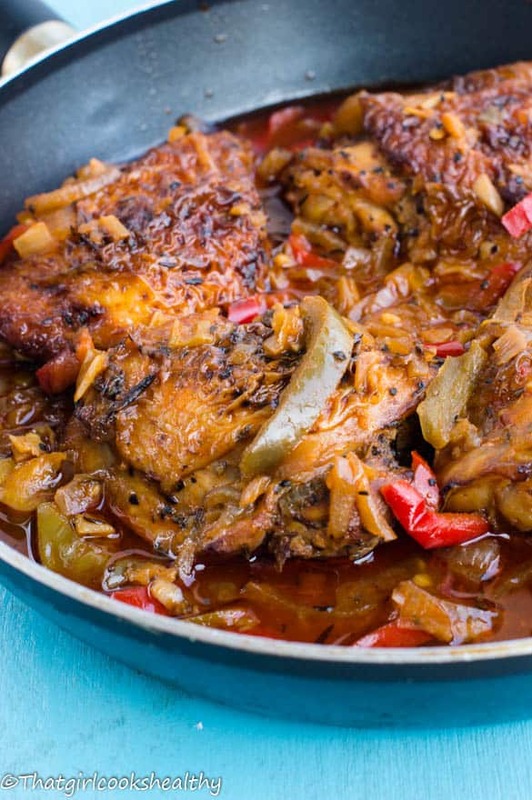 Authentic Jamaican brown stew chicken – experience the epitome of Jamaican cuisine by sampling this generously seasoned succulent chicken in a rich thick gravy. 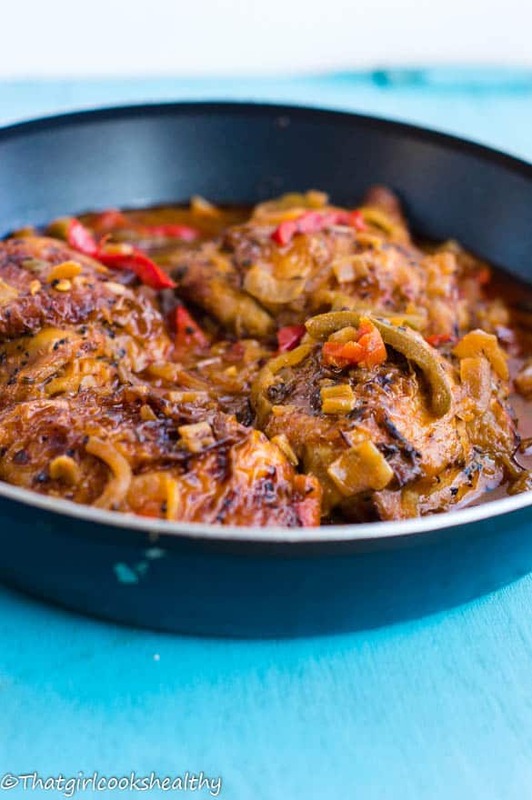 Brown stew chicken is a favourite amongst English speaking Caribbean islands, it is traditionally eating with rice and peas (or peas and rice). Though, times are changing and with cultural trends taking a different direction, don’t be surprised if the masses pair this with something other than rice and peas. I absolutely love Jamaican brown stew chicken and other variants of island style stewed chicken. Yes I am being biased but there’s reason for me to be partial to my roots. 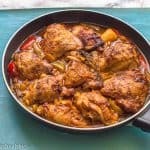 This Jamaican brown stew chicken recipe is SO flavoursome and I promise you this one will impress your guests. 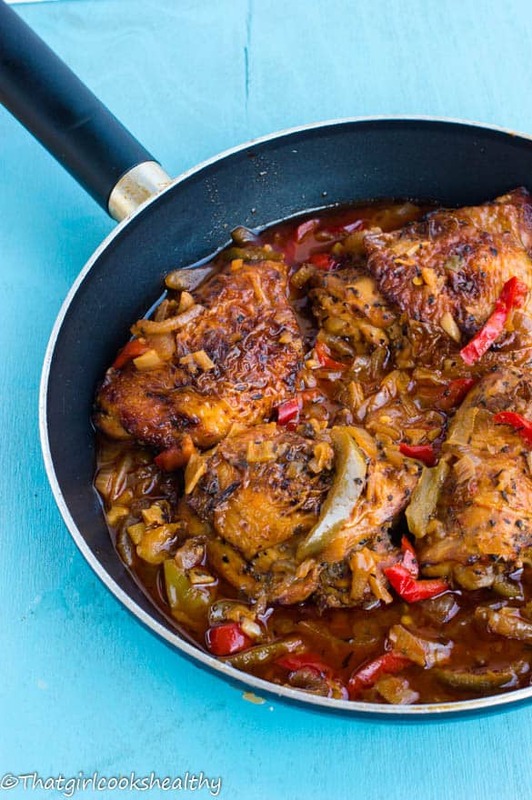 Heck, it’s the most delicious Jamaican brown stew chicken recipe you will ever make!! What is Jamaican brown stew chicken? The name brown stew, derived from the distinctive dark hue that’s created from browning the chicken with brown sugar.I cannot emphasis the importance of yielding that detectable dark brown colour, it’s crucial for that wonderful deep coffee coloured gravy to accompany the browned chicken. Sunday would be the day that we would serve brown stew chicken, although there’s no reason why you cannot make this any day of the week. Like most dishes each Caribbean island has their own variation of brown stew chicken, for now I’ll be showing you how to make delicious Jamaican brown stew chicken. It’s very simple to pull off, once you master this the first time, you’ll be making this for Jamaican chicken dinner all the time – I can tell you that. Is brown stew chicken healthy? Yes, my version is!! As you already know, being healthy is my middle name , so expect a few adjustments to this recipe. For instance, I roasted the chicken instead of frying it in a large quantity of oil. My philosophy is avoid deep fat frying where possible, if there’s a healthier alternative Charla will gladly pursue that root. Coconut palm sugar is a low glycemic index sweetener made from ‘tapping’ the sap of the coconut palm tree. This is by far more superior to the overly processed brown sugar, albeit expensive, keep in mind it’s nutritional properties are retained through it’s minimal processing. Of course the chicken is cleaned/neutralised using the lime and vinegar technique, a traditional way of washing chicken and one that I still uphold as I embark this culinary adventure. The next day is where the fun happens, prior to browning the chicken, scrap off the marinade and store in the refrigerator (we will return to this during cooking). 8, Finally add the browned chicken though before pouring the hot water into the pan. How long does it take to cook brown stew chicken in the oven? The chicken shouldn’t take too long to brown in the oven. There is roughly a 25 minute difference in cooking time. Yes it will take longer than frying, but as I said before, this is a great oil free method to follow through while yielding the same results – a win-win situation right? As the chicken roasts, it will generate it’s own liquid, this is known as the dripping. You can add a tablespoon or two to the frying pan given that the flavour from the drippings is extracts of the overnight marinade. The bell peppers will lend a vibrant colourful flare, the ginger will add warmth, while the pimento adds a hint of tropical spice. The hot pepper sauce provides that heat element, again I have a recipe coming up, so your girl has you covered in that arena too. I substituted tomato ketchup for organic tomato puree which doesn’t compromise the taste at all. Once the chicken has been added to the pan with the other veggies and warm water (use warm water to keep the temperature consistent) – a slow simmer will create a deep enriched brown gravy. There’s always the option of making this recipe in a crock pot. There’s not much difference with the stove top vs slow cook method. You would still need to follow the exact same principles of browning meat, seasoning. The only difference would adding the meat and liquid to the slow cooker instead. Set your slow cooker to the lowest setting and have the stewed chicken cook for 3 hours. Browning sauce is crucial to achieve that depth, not skip this step. Browning is used for that rich deep colour and NOT the same a burnt sugar which yield colour and a subtle sweetnote. 3lb of chicken thighs, washed and cleaned as instructed in the post. Place all of the ingredients for the marinade into a large bowl with the chicken thighs and rub the entire marinade into the chicken, then store in the refrigerator overnight. Preheat the oven on 230 degrees celsius or gas mark 8. Scrap off the excess marinade, store in the refrigerator and proceed to put the chicken in the oven in a roasting pan and roast for 20-25 minutes until brown, making sure to turn over half way through. Once browned, remove from oven and set aside. Heat a large frying pan with the coconut oil on medium heat and add the onions, sauteing for 1-2 minutes until translucent. Then add the bell peppers, ginger, pimento (allspice) along with the dried thyme, tomato puree and hot pepper sauce. Flip the pan – stir and fold the entire contents. Now add the chicken with a tablespoon or two of the drippings and scrap the rest of the marinade which was stored in the refrigerator into the pan. Finally pour in the two cups of water and stir. Reduce the heat to low, cover pan with the lid and allow to slowly simmer for 30 minutes. The water levels will reduce by half and thicken slightly into a rich brown sauce as it simmers. Check the pan to see if any oil is suspeneded on the surface, if so, skim this off with a spoon. Once the gravy has formed, remove from heat and serve accordingly. You’ve got it going on girl! Can never turn down a plate of brown stew chicken- The flavor combination is finger licking good! Love it! Hmmmm looks yummy. I do love a good Stew Chicken Caribbean style! Thank you, it’s a favourite for me too. Do you have to use tomatoes? I cant eat any, so can i use something else to substitute it? Also what are pimento balls? Hey Westly, Tomatoes do create a rich base for the sauce. I think you might be able to get away with pureeing a small amount of red bell peppers instead, that should be a viable substitute. Pimento balls derive from the Caribbean/Mexico, they have a sweetish aroma and provide some warm to your dish. It’s also known as allpsice you can purchase it in ball or powder form. You should be able to pick some up from Amazon or an ethnic supermarket. I hear you can make a replica using clove, nutmeg and cinnamon. I need to research this more before submitting the formula on my blog. This looks delicious! I think pimento balls would be called allspice berries in the States? Thank you. Yes pimento and allspice berries are the exact same thing. Hi Tara, the sugar is used to help caramelise the meat and add flavour. This is a very popular technique in Caribbean cooking, it adds a lovely rich brown hue as well as enhances the taste. Yes Jeffrey. This is a crockpot friendly recipe ;). How long can you leave it for once cooked? Hi Kyle, store the cooked chicken in a container in the refrigerator for 2-3 days maximum. You can also freeze any of the remaining pieces of chicken, just make sure to defrost before use. Thank you for this simple but oh so delicious recipe. Do I triple the amount of ingredients if i’m using 18 pieces of chicken? Hi Blessing. Yes, I would strongly advise that you triple the ingredients to ensure the flavours are still bold. Hi, this looks great but can I substitute these exact steps with fish instead? Yes, that would be brown stew fish instead. Both recipes are very identical to one another so it should turn out just fine. I HAVE GOT to try this!! Man this looks so amazing. I can smell it now. I promise you will be amazed, do let me know if you try this wonderful chicken dish. I was hoping to give your recipe a go today as it looks and sounds delicious! I was wondering about the browning sauce, could you please tell me the ingredients for this and how to make it. Loving the feedback, so glad you enjoyed my brown stew chicken recipe. I don’t know where I went wrong with the browning sauce recipe, but once I added the water to the sugar syrup, it hardened quickly,,,Despite this failing, the chicken still turned out decent. Wishing you even more success in 2017, I’m highly looking forward to the release of your cookbook this summer. Hi Ceil. I’m sorry to hear that. Let’s see if we can remedy it for next time. Did you ensure that the sugar completely dissolved before adding the water? I’m positive that the sugar had completely dissolved…does it matter whether I use hot or cold water? Yes the water would make a huge difference to the end result. I’m almost certain that using cold water was the culprit. Next time when making browning sauce I would suggest using hot water so the sugar does not harden due to the cold temperature level. The water needs to remain warm/hot at all times in order for the sugar to turn into a smooth syrup. Thanks so much, Charla! I’ll heed your advice…Your sorrel is currently being steeped. I was pleasantly surprised to see sorrel at the supermarket earlier this week. I’ll be in touch again tomorrow with the outcome. Charla, I am so happy I have found your website! I loved this recipe. The browning sauce with coconut sugar adds an amazing taste with so little to add to the recipe. I had a hankering for baked beans one day and used your browning sauce. Wow! I used Northern Beans, sauteed onion and red bell pepper, just a few drops of browning sauce, ketchup (sugar free), maple syrup (just a few drops – I guess molasses could be used), onion powder, garlic powder, black pepper and a little of “Slap Ya Momma” spice. Whew! I look forward to making your other recipes. Hi Carla. Thank you for your feedback so glad you liked the browning sauce and yes it’s so diverse, you can make endless recipes with it. I look forward to receiving more feedback from you. Hi I’m looking at making this but I was wondering about the hot pepper sauce, for some reason I can’t find the recipe for it. Hi Rachel, there is no recipe for hot pepper sauce. You can buy it from any Caribbean supermarket. It’s not absolutely essential, only adds a slight kick. Can you tell me how long to cook in the crockpot after browning the chicken in the oven please? Approximately 3-4 hours should be fine. I made this recipe today. It was a huge hit! I haven’t had Caribbean food since going gluten and refined sugar free a few years ago. And I’ve never made Caribbean food — only dined out. I really missed the flavors and decided that I would have to find brown stew recipe that fit all of my criteria. I came across this recipe and your browning sauce too. Made both! My husband and I both had seconds and I have enough left over for dinner tomorrow. I also sautéed cabbage and made jasmine brown rice and black beans. Next time I will make plantains too. The taste and flavors and aroma were everything I was missing! I will most definitely be adding the brown stew recipe to my repertoire. Hi Miss D, Thank you so much for your wonderful feedback. I’m glad to hear that you and your husband loved the brown stew chicken along with the browning sauce. I am sure this would be a Hit in my home. Hands down AMAZING!!! Give me some rice, I am hungry. Thank you! I grew up eating brown stew chicken. This recipe looks delicious and I love that you baked it. You are bringing back some great memories for me with this recipe. Thanks Tanya. Glad it brings back some good memories too. absolutely delicious, my family loved every bite….thanks so much. Looking forward to trying your other recipes!! Thank you so much. I’m sooooo glad your family loved the recipe. 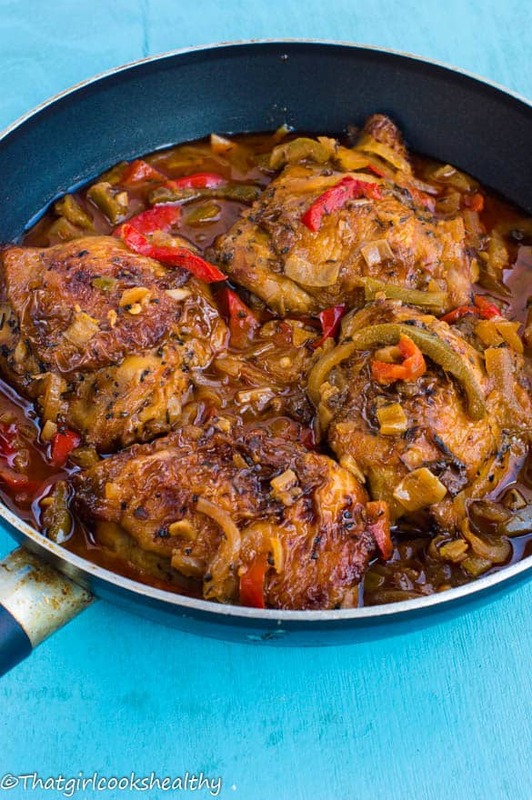 You should try the Haitian stewed chicken, it’s equally as tasty! This turned out wonderfully! Another delicious recipe. Jamaican stews have always been a fave, love the spice mixtures with just the right hint of sweetness. Absolutely lush! I want a bowl, plus the leftovers! Now this reminds me of the old days when I would have my aunt’s Jamaican stew chicken! This looks amazing! Yum! I am not sure what is browning sauce.